Set control rod bell crank (A) in Park position. Set control shaft lever (B) in Park position. With both the bell crank and lever held in Park position, assemble control rod (C) to lever (B), then adjust clevis on rod (C) for easy entry into lever (A). 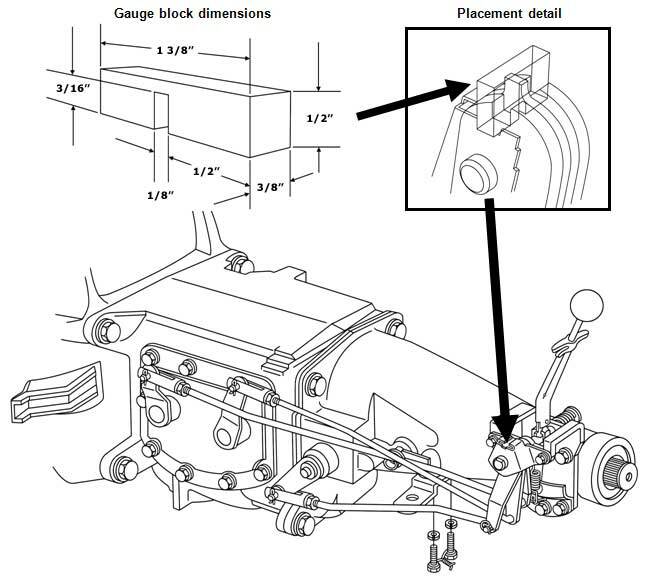 Purchase 271K 1962-64 Powerglide Shifter Linkage Kit by clicking here. The 4-Speed transmission gearshift linkage utilizes three shift rods and levers. A simple gauge block will aid in making the proper adjustments. The adjustments can be made without the gauge block by having an assistant hold the manual shift lever in the neutral positions. Remove transmission gearshift lever seal from the floor pan. Place transmission in neutral and install gauge block in position as shown in illustration. 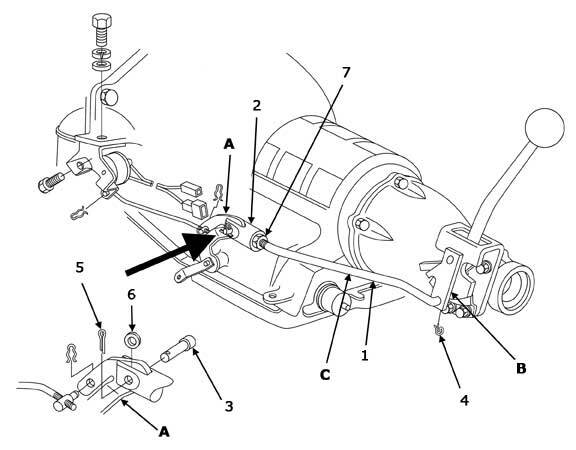 Remove the cotter pin, anti-rattle washer and clevis pin at each shift lever. On each shift rod, adjust the threaded clevis to permit free entry on the clevis pin into the hole in the transmission shift lever. Reconnect the clevises to the shift levers. Remove the gauge block and check the shifts. If any roughness still exists, one of the clevises may require adjustment of approximately one-half turn. Determine the rod and clevis requiring adjustment by sighting along the slot where the gauge block was used in step 2. Purchase 270K 1957-62 Muncie 4-Speed Linkage Kit by clicking here. The 4-Speed transmission gearshift linkage utilizes three shift rods and levers. A simple gauge block will aid in making the proper adjustments. The adjustments can be made without the gauge block by having an assistant hold the manual shift lever in the neutral positions. Remove transmission gearshift lever seal from the floor pan. Purchase 269K 1957-62 Borg Warner 4-Speed Linkage Kit by clicking here.